OXYGEN = POWER from NATURE Take the decisive step towards greater vitality and quality of life with OxyCure. After the first application a remarkable revitalization of the skin is noticed. A very good effect will be achieved with 3 to 4 applications on consecutive days. A long lasting potency with maximum effectiveness brings you the oxygen beauty regimen: 10 applications to 10 possible consecutive days. Intermediate interruptions 1- 2 days do not affect the result. For a permanent effect, undergo regular monthly applications. 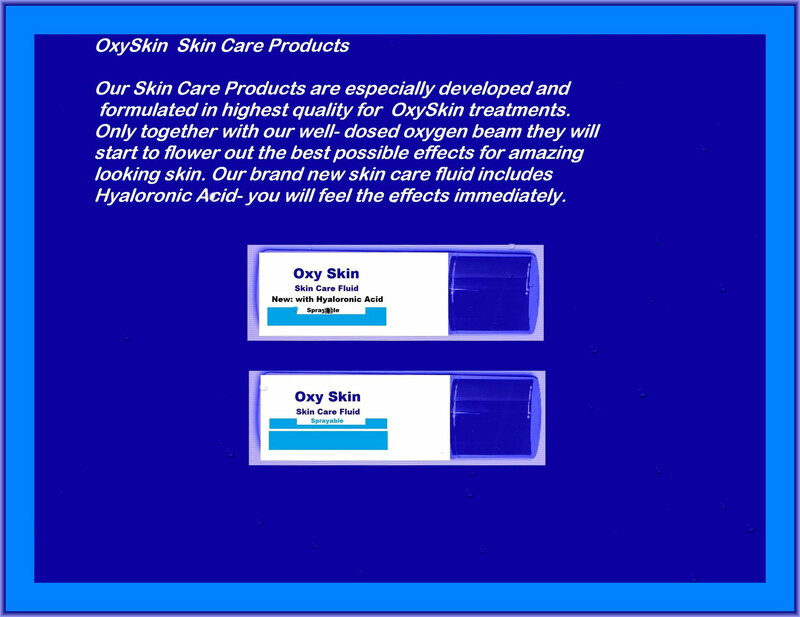 Proved that problem skin benefits highly from oxygen Beauty Massage. Clogged pores are usually the main cause of blackheads and pimples, the main trigger is an increased production of sebum. The oxygen Beauty Massage cleanses your pores and normalizes sebum production and is the way for a pore deep clean, soft and smooth skin. Why not try our brand new skin care fluid with hyaluronic acid? that required by your body.